3 Air Pads. 16 Months of Testing. Here are the results. 3 Category ratings and tech details. This guide is dedicated to a brand that’s been dominating a number of guides in the sleeping pad categories: best overall, most comfortable, most durable, beast value for money and a few more – the ALPS Mountaineering. After we noticed the trend, it only made sense to further scrutinize the 3 pads that stood out, include a few of our most trusted featured testers and see where that gets us. Bottom line – this whole guide is all about the comparing the three sleeping pads coming from ALPS (Lightweight, Featherlite and Comfort series) side by side. Note: if you are looking for a full air mattress instead of a pad, see these guides – best camping air mattress or best air mattress Overall (home use). Category ratings and tech details. (for size Regular) 20 x 72 x 1.5 " 20 x 72 x 1.5 " 20 x 72 x 3.5 "
Moving on to the details of each pad, what our featured testers had to say and last, but not least, what the users are saying. Very little is left to chance with this sleeping pad and it seems to address pretty much every concern a camper or a hiker might have. It packs small and fits into the included sack. The fabric used for the top of this pad is different from most used in air pads, it’s what the company calls light diamond Ripstop and the bottom is taffeta polyester. Stripped of the fancy terms, this means that the pad is made to withstand the rigors of the trails or the campsite and outlast its competitors. Based on what we’ve seen and what our featured testers are telling us, it’s doing the trick and the materials make the pad long-lasting, less prone to rips and punctures, well insulated and comfortable. The comfort is where it really shines and the open-cell foam added (what they call jet stream) does make a difference compares to a regular sleeping pad. Normally, you would carry a foam mat and add place it on top of sleeping pad for extra comfort or on the bottom for extra protection (ideally, both). With the ALPS Mountaineering comfort series the need for the top mat is practically eliminated but no mattress what the company ways about the toughness of the bottom. We still wouldn’t go so far as to say that a foam mat placed underneath a pad wouldn’t go a long way towards prolonging the life of your sleeping pad. We camp and hike a lot and have always had troubles finding the right sleeping pad for my husband who weighs over 260 lbs. It was always a choice between getting an expensive sleeping pad that’s also not an option unless we’re car camping because of the weight or listening to him complain about sore muscles with the thinner mats. This ALPS fits the bill, it’s just sturdy and thick enough for him to be comfortable and still packs small and light enough to be carried around. My wife and I got the double version and the joint works just as described. When it’s not on the trail with us, we keep it on out boat, it comes very handy for small boats. The valve is great, it works fast and it seems well made, it’s metal inside and seals the air in no problem. The self-inflating valve is the Achilles heel of every pad of this type. The one on the ALPS Lightweight is easily in the top 3 we ever tested, both in speed and retention. The ALPS Lightweight is rated at 92 out of 100 which make it the top-rated sleeping pad on 3beds.com. Does this mean it’s the absolute best the market of sleeping pads has to offer? Overall, we believe that it does. But bear in mind that one of the categories we are rating in is the value for money and from what we’ve seen you can’t get a pad that would be significantly better not only in its price range but in price ranges twice or trice the tag. The main strong suits are the comfort and the value for money. The main downsides are that it’s bulkier than the ultra light sleeping pads and probably isn’t the best choice if you are backpacking. It was rated at 90 by users and 91 by our featured testers. About half a pound heavier than the Lightweight series (comparing regular sizes), the Comfort series features a similar pump technology (JetStream). It comes in only one color (moss green) and the bottom is optimized for minimal slippage (DOT PVC, which is a fancy way of saying the bottom material has dots that allow a better grip). The anti-slip materials are especially important if your sleeping arrangement is such that the pad is placed directly on top of the tent surface. The top material is softer to touch and it has a velvet-like feel top it (you might not be able to tell by the pictures because it looks kind of plasticky). The valves of the pump are brass, which makes them corrosion resistant and the pump itself is easy to operate and inflates. After you have inflated it for the first time following the recommendation of ALPS it inflates/deflates within 2 minutes. The moment I unpacked this I could feel how ell it’s made and that it’s built to last and it lived up to my expectations on the trail. After the initial ritual of blowing it up for the first time, all it takes is a minute or two to be ready for good night’s sleep. I’m glad I didn’t splurge on a similar pad I was looking at that cost much more. I’m loving the moleskin finish of this pad, you don’t get that unpleasant synthetics feel of the pad slipping beneath you. We used to carry a Coleman queen air mattress to our camping trips but right now, I can’t even imagine dealing with that kind of bulk and weight. It’s ALPS all the way for me from now on. It’s great value for your buck, it’s foolproof when setting up, amazingly comfortable for a sleeping pad and packs very small. I am not exaggerating when I say that it’s so comfortable that I felt like sleeping on regular mattress and I was in the deep wild of the Rockies. I have to admit that I didn’t expect this from a pad at this price point. Only good things to say about the ALPS comfort, it’s exactly what I was looking for after going through 4 sleeping pads in the last 3 years. It can be kind of annoying inflating it for the first time and following those instructions but it’s more than worth it. 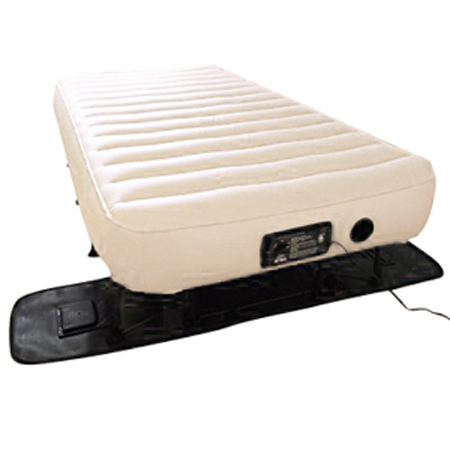 This pad is a great combo of the comfort that a foam mat offers and the support of a regular Aerobed air mattress that I used to carry around. I tried both and I know what I’m talking about. For a trail, it’s safe to say that this pad is luxury at a low price. I’m not going back to thick foam mats or to full-blown air mattresses. A regular mattress proved to be too much of risk. It does raise you more and offers more of a homey feeling when camping but I’ve been left with a punctures piece of plastic one too many times. On the other hand, you have a foam mat that costs next to nothing but offers the same comfort; you are pretty much sleeping on the ground. This baby doesn’t sleep like a thin pad, it offers a similar feeling to that of an air mattress without the huge puncture risk but packs like a foam mat and I can easily strap it on to the side of my backpack. I’ve seen no air leaks with this ALPS which has always been an issue when sleeping on the trail; I’d wake up on the ground. It sets up and own in minutes and in terms of firmness and comfort it feels pretty close to the high-end mattress I have at home. This is my 3rd ALPS pad and the first time I am really disappointed, the pad I received was defective on arrival. It just won’t inflate.. This is the best-rated ALPS pad as per customers. Similar to the Lightweight Series, this pad stand tall when compared to similar pads that cost much more. We especially like how comfortable the pad with the, as one of the users vividly put it, moleskin feel to the finish of the pad. As we always mention, air mattresses and sleeping pads are sensitive product and can get damaged in transport. That’s why we developed statistical “read lines” to recognize the issue that belongs to that group and true issue with the quality of the product. The ALPS Comfort was well within all those ranges and it’s a well-made product. It means that this is a good pad and if you’re unlucky to get a product that doesn’t work well on arrival (most of the issues we’ve seen are related to inflation), you just replace it. We did some mystery-shopping with the ALPS ourselves and can report that their customer service is very-friendly and efficient when such issues arise. One of those times, the product was replaced and on our doorstep within 18 hours. Its overall rating of 90/100 reflects our opinion about the ALPS comfort series. Perhaps the modern design also played a role in most of our testers being interested in taking the Featherlite for a spin. Whatever the case, the more data we have to go on the more reliable our results are and the more confident we are to rate a sleeping pad or mattress. You might take a look at our table of rating and say that the Featherlite is not as good as the Lightweight or the Comfort series. It’s not that simple and we wouldn’t say that. As the name tells it, the Featherlite is by far the lightest pad on this list and packs the smallest by far. The good news is that ALPS as a brand went down the road of offering more then competitive prices and instead of choosing one more expensive pad that would provide less flexibility. You can get one of the first two pads on this list and the Featherlite and still spend less than going with some of the more expensive brands. Another piece of good news is that wouldn’t mean sacrificing comfort or quality…not according to our tests and not according to the reviews of our featured testers. Bottom line – the Featherlite will be the choice of backpack hiker if every ounce counts. If you showed me this pad and asked me to guess the price, I would’ve guessed two or three times higher than it actually costs. I just had it for about a month and slept on it just twice but it looks and feels like a high-quality product. The pump valves are brass and feels much better made then the ones I have on my Thermarest; it’s pretty comfortable and packs so small. I didn’t think it would make a difference but the pillow-like pattern seems to be a much better design choice comfort-wise then the top to bottom chambers like in my old Big Agnes. This pad is for the backpack hiker who does his best to make every ounce counts. The girls will love it on its own and the boys might find it narrow and need to pair it with a foam mat to be really comfortable. It’s rated at 86/100 in the last update; it was a winner with a vast majority of our featured testers (most of them men). They rated it at 87/10 and the users gave it an 84/100. It’s still “young” and needs some more time under its wings but so far it looks like a great option for light and backpack hikers. Bottom line – the ALPS Featherlite is here to stay and give the best (and more expensive) sleeping pads a good run for their money. Each of these pads does deserve the high ratings it received. They all shine more in some quality aspects and will be “just right” for most people. The Comfort and Lightweight series are a better choice for those who are car-camping or have no problems with a few extra ounces strapped to their backpack while the Featherlite will be the choice of those looking to go as light as possible. In terms of value for money – these air pads have very little competition and ALPS did make these to fir their mission statement – provide the best possible quality for low, low prices. On 3beds.com, these are right up there at the very top batting it off with the highest quality pads and are the currently the best rated in value for money category. As always, let us mention that we do our best to stay on top of things at all times. We update the ratings and the reviews b-monthly based on new info and conduct full-on tests once a year (or 6 months if we decided it’s needed to keep the data accurate). Let us know what you think of these if you are a proud owner or apply to be one of the testers by leaving us a comment or dropping us an email.